Don’t let the unusual color of these bars put you off because when it comes to flavor they are the embodiment of summer – especially if your idea of refreshment on a hot summer day is a cold glass of lemonade. 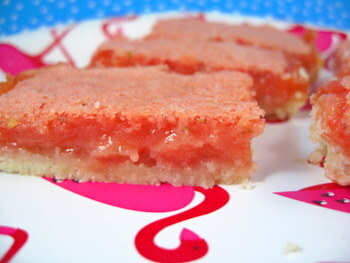 They are strawberry lemonade bars, a play on traditional lemon bars that takes advantage of in-season strawberries to make an outrageously good variation of a bake-sale favorite. The bars are really simple to make and that gorgeous watermelon pink color of the custard/curd topping is entirely natural. There is no Jello, no food coloring and no other odd ingredient added to create the pink hue. It is the result of adding freshly pureed strawberries to a sweet-tangy lemon curd mixture and nothing more. 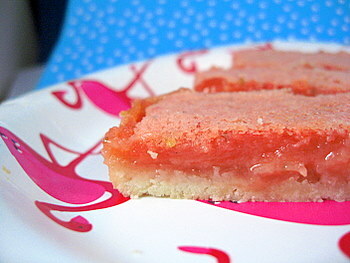 These bars have a fairly substantial layer of strawberry lemonade on top of the crust and not only is the flavor great – tangy and bright from the lemon with a warm sweetness from the berries and sugar – but the texture is, as well. The custard is soft and slices best after it has cooled completely, although it does cool down enough to slice cleanly without oozing. It melts in your mouth and really does taste like strawberry lemonade! For the crust, I used my favorite shortbread base, one that I’ve used with cheesecake bars and other lemon bars. I like it because it is substantial and will support a thick custard filling without getting soggy, but is also tender and buttery. Plus, it’s easy to make and the filling can be poured in while the crust is hot, so there is no need to wait around for cooling during the cooking process. I used my Baker’s Edge pan, but a 9×13-inch baking pan will work just as well for this recipe. The bars are excellent when chilled and should be stored in the refrigerator on a hot day, but I like them best when only slightly cool or at room temperature. Try to have extra ingredients laying around when you make these because you definitely will end up with requests for additional batches. Preheat oven to 350F. Lightly grease a 9Ã—13-inch baking pan (or use the Bakerâ€™s Edge pan, if you have one). In the bowl of a food processor, combine lemon juice, lemon zest, strawberry puree, sugar and eggs and process until smooth. Add in flour, baking powder and salt, then pulse until smooth. I made these today and they are wonderful! Like Linda, mine do not have a crust, yet stay soft but firm when cut. If you have not made them yet, please do!! So good!! I found this recipe on another website and wanted to come say how much we love these bars! We already love lemon bars but these are so different and awesome! :). Great job! Greenpoint-Williamsburg CSA » Week 3 Recipesâ€¦What to do with wilted Arugula, old Pea Shoots & mushy Strawberries. Plus, the Mighty Scapewich!